Columbia, Mo. (April 23, 2015) — SoundStir, an Android app designed to be “the only mobile community for public radio listeners,” has won the grand prize in the eighth annual Reynolds Journalism Institute Student Competition. This year’s sponsor was the Public Media Platform (PMP), a digital repository of audio, video, photos and text from five major names in public media – NPR, PBS, American Public Media, Public Radio International and the Public Radio Exchange (PRX). 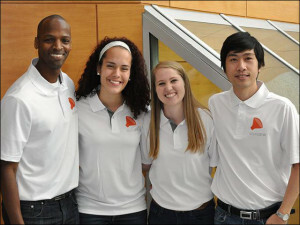 SoundStir, from left: Kristofferson Culmer, Alix Carruth, Rachel Koehn and Son Nguyen. 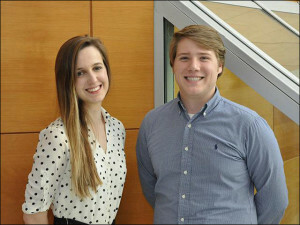 Students from the Missouri School of Journalism and the University of Missouri College of Engineering teamed up to create prototypes of products and services that bring new users to public media and enhance the database that powers the PMP. SoundStir lets users customize a feed of public radio stories by favorite topics, then employs a matching algorithm to create communities and connect individual users around those topics. At the same time, the app collects a wide variety of metadata that can feed back into the PMP to help public media providers better tailor content to their users. 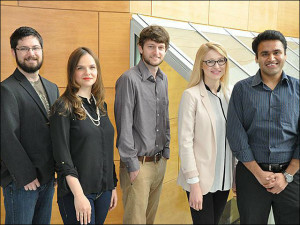 Members of the grand prize-winning team are Alix Carruth and Rachel Koehn, seniors in journalism; Kristofferson Culmer and Son Nguyen, doctoral students in computer science; and Manav Singhal, a computer science master’s student. The judges also gave a Technology Innovation Award to Turnip, a white-label app that serves younger users by automatically matching public media stories from the PMP archive with topics trending on Twitter. The data collected by Turnip also helps public media producers understand and act on the patterns found through their algorithm. Team Turnip’s members are Tatiana Darie and Olga Dorovskykh, master’s students in journalism; Mike Phinney, a doctoral student in computer science; Sean Lander, a doctoral student in informatics; and Abhishek Shah, a master’s student in computer science. 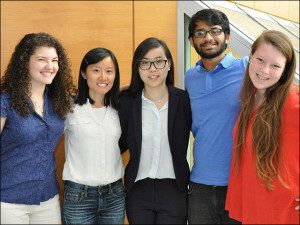 Story Grove, from left: Brittany Crocker, Lingxue Wu, Bao Deng, Manny Pottipadu and Jennifer Prohov. Delve: Kara Tabor and Tom Weidmaier. Turnip, from left: Sean Lander, Olga Dorovskykh, Mike Phinney, Tatiana Darie and Abhishek Shah. The SoundStir and Turnip teams will receive an all-expenses-paid trip to Washington, D.C., in mid-May where they will pitch their products to a group of public media executives at NPR and tour top news organizations in the nation’s capital. For the first time in the competition’s eight years, four teams made it to the final round based on the quality of initial pitches they made last November. Team Delve produced a Google Chrome browser plug-in that analyzes the text of any webpage, pulls related content from the PMP’s archive of public media stories and displays clickable summaries of those stories in an easy-to-use sidebar. Delve’s members are Tatiana Alexenko, a master’s student in computer science; computer science senior Tom Weidmaier; and journalism juniors Natasha Brewer and Kara Tabor. The fourth finalist team created Story Grove, an Android app that gives users a creative way to curate public media content by cultivating trees of related stories in a virtual backyard, then share those collections with other members of the Story Grove community. Brittany Crocker, a master’s student in journalism; Bao Deng, a journalism senior; Jennifer Prohov, a journalism freshman; Lingxue Wu, a master’s student in computer science; and Emmanuel Pottipadu, a senior in information technology, make up the Story Grove team. Each member of the finalist teams also will receive his or her choice of an Apple Watch Sport or an Android smartwatch. Judges for this year’s RJI Student Competition were Ann Alquist, membership director for Alaska Public Media; Shane Guiter, chief operating officer of KCPT in Kansas City; Cristina Hanson, deputy director of the Veterans Coming Home initiative at Wisconsin Public Television; Randy Picht, executive director of RJI; and Randy Smith, Reynolds Professor of Business Journalism at the Missouri School of Journalism. Each team received weekly mentoring from Kristin Calhoun, executive director of the PMP; Ryan Cavis, PMP principal engineer; Dale Musser, director of the IT Program in the University of Missouri College of Engineering; Tyten Teegarden, lead developer at RJI; Jack Howard, journalism junior and leader of last year’s winning team; Mike McKean, Futures Lab director at RJI; and Reuben Stern, Futures Lab deputy director.